You might be wondering why I wanted to review HBL Hair Care’s Volumizing Shampoo and Conditioner since I do have thick hair. Since I have layers and some natural curl in my hair, I have found the volumizing products often perform very nicely on my hair to pump up those curls even further. Being already aware of how amazing the HBL Hydrating Shampoo and Conditioner leave the hair, I was curious how these products would work in regard to making most of my layers. 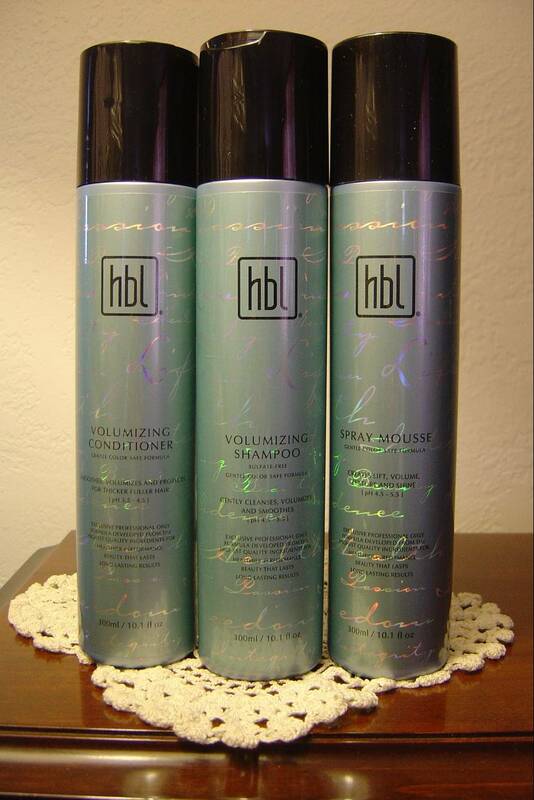 The HBL Volumizing Shampoo has Jojoba Seed Oil and Keratin Amino Acids for repairing and strengthening the hair. In addition, there are silk proteins for manageability and shine. This shampoo is also safe for my color-treated hair and was sulfate-free. The smell alone of this product was enchanting as it worked into a rich lather of fragrant foam. After I rinsed, I added some of the HBL Volumizing Conditioner with Vitamins A, B, E, which act as natural antioxidants while Panthenol helps with thickening and moisturizing. A host of silk proteins is also in this formula to boost hair’s volume without weighing it down. Even with a lot hair, I found this conditioner did a great job for untangling hair as well. The new HBL Spray Mousse is unique and will save you from applying too much mousse as we often do. Unlike the typical foam that you pump to expand in your hand, this one can be sprayed on the spot where it is needed for better control. I liked how the Panthenol in this mousse turned up the volume of my layers so my waves and natural curl appeared fuller. The Glycerin in this HBL Spray Mousse worked wonderfully as a humectant for a soft, pliable touch while the special resins provided a gentle luster of revitalized, more beautiful hair. I really think these products from HBL Hair Care are excellent. Regardless of your hair type, if you have layers like mine and want to build up your natural curl or waves, then I do suggest that you check these out. However, if you are not sure of which products are the best for your hair type, you can get hair help with their product selector tool to help you figure it out. Do check that page because it can guide you to the best one for you. Thanks to HBL Hair Care, one lucky Nuts 4 Stuff reader in the United States wins a HBL Volumizing Shampoo (10.1 fl. oz. ), Volumizing Conditioner (10. 1 fl. oz. ), and Spray Mousse (10.1 fl, oz. ), ($97 total value)! This giveaway ends February 6, 2012 at 12 PM Eastern Standard Time. The winner will need to respond to my email with name and shipping address within 48-hours or another winner will be picked. I would also love to try the Revitalizing Treatment!Email is in my profile. I really want to try the Shine and Seal. My hear can really use it! I like the volumizing shampoo. I would like to try hbl Shine & Seal. I would like to try the hydrating shampoo and conditioner. I want to try the Shine and Seal. Entered Kō Denmark's Organic Jasmine & Neroli + Body Wash Review and Giveaway! like hbl on fbjessicap067@gmail.comjessica c.
(2) like hbl on fbjessicap067@gmail.comjessica c.
I would like to try the HBL Straight & Style because I have such long unmanageable hair. Thanks for sharing another great review and giveaway. #2 Following @Nuts4Stuff @Twitter too~!exotic1TYVM~! I'm a happy google follower!Emmy C.
I'm already a follower -Gina MariaaMy email is gmwestfall1@gmail.comAnd I want to try their straightener protectant! I'd like to try their leave in conditioner. I tweeted the requested message on Twitter at https://twitter.com/#!/likwan/status/166482054450651136.